Really enjoyed our trip with Japan Deluxe Tours! We had a positive experience with our Japan tour. The hotels were good quality which we liked very much. Our tour guide Hide-san was simply excellent. We were able to see so many different sites during our Japan tour which was great. 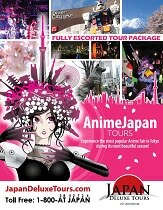 Overall I can say that we really enjoyed our trip with Japan Deluxe Tours. It gave us a really great overflow of Japan and we hope we can come back again soon! Hotels were good quality which we liked. Capsule hotel is separated by gender which would have been good to know beforehand. Our guide Hide-san was a excellent guide - thoughtful to our needs. The guide for the fish market left us behind so we had to find our own way back which was a bit stressful. We did see a lot, however because of that I guess we did not have a lot of time at each location. (We are probably a bit more adventurous than most).